Your Personalized Road Trip Planner: RoadNinja takes the stress out of planning a road trip. You’ll always know what’s available at upcoming exits – even up to 3,000 miles ahead – so you’ll never miss the next rest stop, no-fee ATM or your favorite restaurant chain. Customize the exit list with your favorites, filter exits by category, plan ahead with the interstate directory, and access turn-by-turn directions off the interstate. Soak Up The Savings: Use the app to view and compare real-time gas prices, find and book the lowest hotel room rates, and redeem location-specific special offers and coupons along the way. RoadNinja saves travelers time and money – plus, the app is FREE to download on iOS and Android devices. Stay Connected: Social media junkies can find and share reviews, promotions, and favorite places on Facebook, Twitter, Foursquare and Google+. 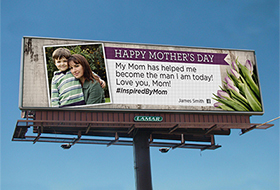 If you're hitting the road this Memorial Day, you'll see Lamar Advertising Company's digital billboards featuring the RoadNinja designs below. The digital campaign starts on May 19 and will run for the next month.